Boeing will report Q3 results before the bell tomorrow (released results last quarter at 7:30am ET). The co has a conference call scheduled to follow at 11:30am ET. Cap IQ Consensus estimates Q3 EPS of $2.62 (vs. $2.52 in 3Q15) w/revs of $23.60 bln ( -8.7% y/y). In the Q2 earnings release, co lowers FY16 EPS to $6.10-6.30 from $8.15-8.35 vs. the $8.50 consensus; reaffirms FY16 revs of $93-95 bln vs. the $93.84 bln Consensus; reaffirms 740-745 commercial airplane deliveries but lowers operating margin to 4.5-5% from 9%. 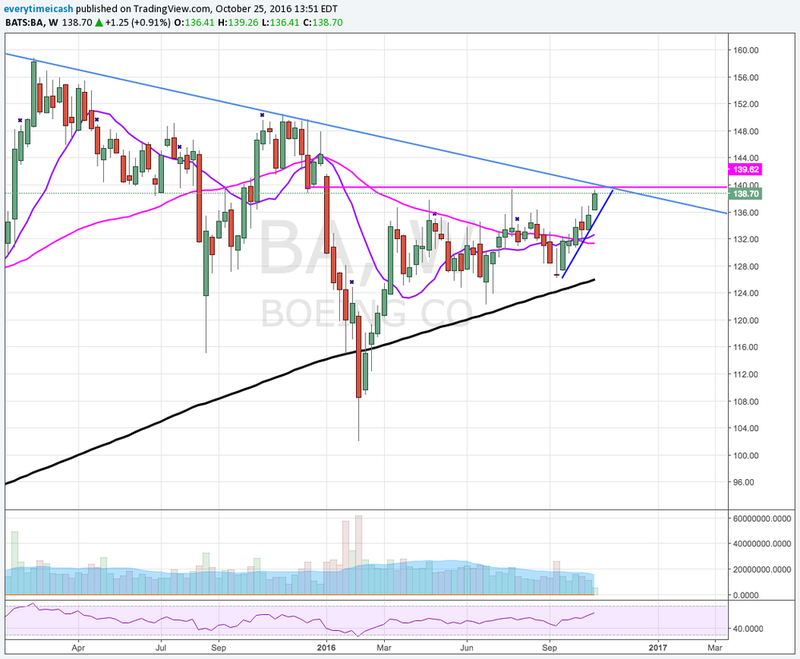 BA was initiated with an Outperform at Robert W. Baird; tgt $161. Firm believes the FCF dynamic at BA continues to be underappreciated especially with $25 billion in FCF being generated during 2017-19 with ~$17 billion available for buybacks after dividends. Ramping build rates, seven-year backlog visibility with record low deferral rates, stable R&D costs, and productivity improvements lend to returning significant cash to shareholders. Their price target is $161 based on 11x their 2018 FCF estimate. Buying the pullback in BA shares as bear points priced in at current levels (October 6th). Reports Q3 (Sep) earnings of $3.51 per share, including $.98 in favorable tax items, may not be comparable to the Capital IQ Consensus of $2.62; revenues fell 7.5% year/year to $23.9 bln vs the $23.6 bln Capital IQ Consensus. Co issues reaffirms guidance for FY16, sees EPS of $6.10-6.30 ex-$0.70 favorable tax adjustment vs. $6.29 Capital IQ Consensus Estimate; raises FY16 revs $500 mln to $93.5-95.5 bln vs. $94.04 bln Capital IQ Consensus on higher commercial deliveries: to 745-750 from 740-745. Co anticipates modest U.S. Federal defense spending growth in the next five years. Regarding the 747 program, the co is encouraged by modest recovery in the air cargo market. Co delivered 188 commercial airplanes in the quarter. 38% of business comes from customers outside of the United States. Co paid $700 mln in dividends, repurchased 51 million shares during the quarter for a total of $6.5 billion. So far in 2016 co has added 17 net new 777 orders, on track to transition to 7 per month. Encouraged by recent Qatar airways decision for 10 777s. Co will provide FY17 guidance during the Q4 earnings call.